The boys and I were on our way to school last week when I saw a bull elephant on the road heading towards me. He was quite a distance away still, but I could see I was going to have to wait a bit. He had this typical swing in his step of a bull in musth: urine dripping and staining his back legs. And I could smell him a mile away. Elephants in musth that walk in the road don’t easily give way. For anything. This road is mine people! Bulls can walk on the road like that for kilometres. Traffic jams forming both in front of and behind the elephant, the people in the cars not sure what to do. Behind the elephant is definitely the place I would rather be. The people in the traffic jam in front always have this panicked look on their faces. “Can I turn around?” “ Will I be able to reverse without backing into someone?” “What if he charges?” Definitely a bit of a predicament to be in, especially when it is getting close to gate closing time! It is not just the bulls in musth that make me think elephants have a sense of humour. I was on a sunset drive once with my friend the guide from Lower Sabie. We were watching this elephant that was busy feeding on a tree from up close and personal. You could see the elephant was a bit unsure of what to do. He was swinging his front foot and rubbing his eye with his trunk. Almost as if he was telling us “can I just eat in peace here please?” Then, he picked up a branch and threw it towards our truck! Everyone had a lekker laugh. We got the message loud and clear, and let the big guy enjoy his tree on his own. Then there was an elephant bull my friend from photography school and I watched at a waterhole. It was during the heat of the day and we were on our way from Satara to Olifants during a fantastic two-week Kruger vacation. We watched this big bull while he was having a drink at the waterhole north of Ngotso. He had the place all to himself for a while, but it did not take long for a big herd of impala to show up. A group of zebra wasn’t far behind them. This obviously annoyed the elephant. And even though the poor thirsty impala and zebra kept a respectful distance, the elephant took a big trunkful of water and sprayed it all over them! This scared the living daylights out of the parched animals and they scattered. The big bull, or should I say bully;-) then left, with a smug look on his face. Baby elephants are extremely amusing to watch. They still need to learn how to control the muscles in their tiny trunk. I have seen them try and use their trunk to drink water, just like the big elephants do. But they just did not manage to get it right and flopped their useless appendage around in frustration. Eventually just diving into the water face first to get a drink. The way they mock charge a car or an innocent guinea fowl just to try and scare someone is absolutely adorable! A young elephant trying to look bigger than he really is! So if elephants have a sense of humour, it would totally explain why they leave branches and twigs scattered all over the road. Branches so big, you have to slalom around them in order not to get one stuck under your car. The same goes for all the dung heaps in the road. No one wants to drive over those! It almost is as if they design an obstacle course for the cars just before the gates open. I like to think they then watch from a distance! Have you ever experienced something that makes you think elephants have a sense of humour too? I would love to hear it! I so love reading your blogs Linda. Always waiting for the next one. Thank you so much Elizabeth!! Glad to hear you enjoy my stories!! When having years ago a guided tour, die we saw two bulls coming towards the road. The driver stopped to let the Elis cross the road, they dully crossed over, having in the Kruger park in any event the right of way, taking same for Grabrede. and walked back giving us a close look up…almost read the Elis mimic as to say, ok have seen who came by and followed his friend further. A short close encounter, eye to eye. Certainly unforgotten! 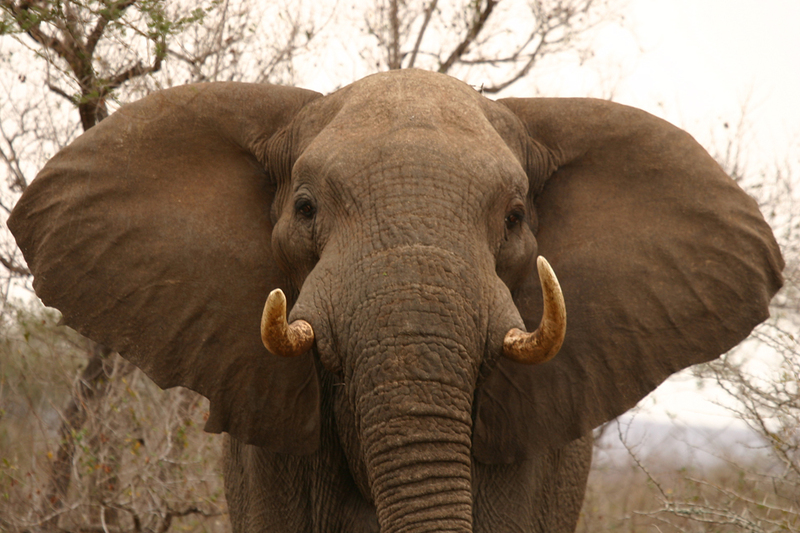 Hi Margit, A close up encounter with an elephant like that is always amazing!!! They sure do, Linda! We had several incidents where we were sure they were just waiting for a car or other animals to have fun. And with a little imagination we could even see them smile. My husband being elephant mad, that’s where we always stopped and spent hours in the park. Love your blogs as always. I know right! I love watching them too. They are always doing something interesting. It is amazing to spend time with them! Hi Linda, just love this one! It so mirrors what i have been thinking and observing for a long time. The bull that tossed the branch – such a wonderful illustration! A friend and I once watched a bull drinking water from a trough at Mavumbye. There was a mass of game – wildebeeste, impala, zebra – all waiting to come to the trough or past it to the little pan, but the bull was having none of this – a quick turn of the head, a swing of the trunk, a trumpet – and everyone stayed where they were. Having had enough to drink the bull then amused himself by swinging his trunk back and forth lazily through the water in the trough, blowing gentle bubbles as he did so, for several minutes as all the animals waited. I swear he was laughing inside . . . .
We have also reversed for a kilometer or more before a large bull – notably down the H1-1 in the DeLaporte region on two or three different occasions ( I saw a write up once by Ecojunkie, with pics – same thing, same bull!) – and each time that bull was very happy and relaxed and I could almost feel the smile! I think most animal behaviourists now would disagree with not attributing so-called human emotions to animals. Elephants in particular show an amazing range of emotions, and although they don’t use facial expression in the way that we do, they sure use body language. They can sense emotion incredibly well too. . . .
Sal, have you read Lawrence Anthony’s book about the herd of ‘problem’ elephant he brought onto his game and saving them from being shot? It is called the elephant whisperer. It is an amazing read. When the author died a few years ago, that morning the whole herd came past the lodge looking for him. Or to pay their respects. I cried my eyes out reading that! You are very right about their range of enotions. That is what makes them such amazing creatures!! Great book. One of my favorites. Sometimes heartbreaking. It is a book I could read over and over again. His book about rhino’s is also very good! I loved the story about the herd usually coming to the house exactly in time for Lawrence’s return from business meetings in Johannesburg. Most amazing however was the occasion when his flight was delayed – they were there on time for his scheduled arrival , but left again , just to reappear when he finally arrived! Telepathy ? Me too! I think he developed such a special bond with Nana, the matriarch. When I read the report that he passed away and how his wife described the herd coming to the house that day, I just cried my eyes out! Not sure if it was humour but just north of the Shingwedzi bridge you can turn off and drive along a winding road by (usually dry) riverbeds and eventually – if you don’t turn right – you come out by Babalala. Anyway we had not gone far when my microbus skidded to a stop and no amount of back and forth would work so I had to get out and look. A branch, stripped by an ele had been flicked up and twisted itself round the brake fluid pipe to the left rear, apply the brakes most efficiently. I had a dustcoat in the car and my trusty Swiss army knife and had to lie under the car and saw through the branch in two place before I could get it out. Rose was having the jitters and I kept telling her to stop and just keep an eye out for lion and hyena….it was an interesting, sweaty (it was about 9 am in mid summer) and grubby job but thank goodness for my pocket knife that has a saw on it!! We once had an elephant calf standing in the middle of the road. So we stopped at a respectable distance. Not noticing the mom standing next to us, hiding in the bushes, behind some trees.. She started trumpeting the minute we stopped. I’ve never put a car in reverse so quickly. In 2015 we went on a game drive at sunset at Mopani and encountered a bull in musth, the poor driver had to revers for more than a kilometre and the bull kept coming. He stopped and then the bull deliberately picked up speed flapping his ears. In Kruger I often came across elephant roadblocks as I call them where on a gravel road that is small a tree is pushed over and one has one of 2 choices reverse and turn around or find a way around….. I do believe they have a bit of an attitude at times – who would not if you had size on your side….and a wicked sense of humour. Oh my word! Dread the thought of an elephant coming towards me when driving in Kruger with my Sherpa Tiny.
. I would not be able to reverse. I would just sit and pray! Eish ja when you towing it is always scary to find yourself in a situation like that! !